Wheels: 1-15/16" dia. prelubricated ball bearing with hardened raceway. Wheel Capacity: 25 lbs. per aluminum wheel. Axles: 1/4" dia. galvanized steel bolt-type axle and lock nut. Frames: Formed heat treated aluminum channel 2-1/2" x 1" x 1/8". Couplings: Hook and rod. Hooks on one end and rod ("stud") other end. Frame Capacity: 160 lbs. max. distributed live load per 10' section or 750 lbs. per 5' section. Other sizes, wheels per ft. and curved sections available, prices on request. Manual gate assemblies are one of the most common conveyor accessories. Simple to install, manual gate assemblies offer passage to and from operator work cells as well as providing access for fork trucks, walkways, etc. Gates include hardware and conveyor section. Maximum length is 5'-0". Maximum weight of gate section must NOT exceed 75 lbs. If gate weight (i.e. 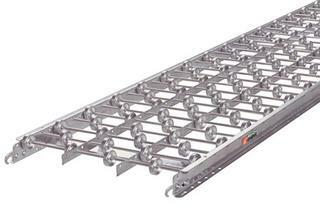 conveyorsection) exceeds 75 lbs., use spring loaded gate. Roach spring loaded gate assemblies may be used to provide openings and walkways for operators, pedestrians or fork truck traffic or to simply make work areas in and around conveyors readily accessible. Tensioned springs offer increased lift capacity with minimal effort. Gates include hardware and conveyor section.